Ben 10 gets to race against time in this one. Yes! Ben 10 Savage Pursuit is a breathtaking running game for kids. Packed with the full adrenaline rush and deadly mutants from Dr. Animo, Ben 10 Savage Pursuit is one hell of a game for fans. 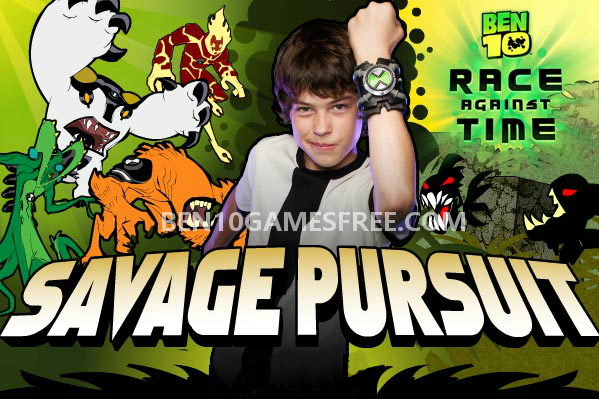 Ben 10 Savage Pursuit Game is an adventure running game based on the 2007-movie called Ben 10 Race Against Time. The game takes Ben 10 on a pursuit to save the world from the evil Dr. Animo and his mutants. Ben, Gwen and their Grandpa Max know that Dr. Animo is up to no good and his invention could be extremely harmful to the humanity. So, they decide to check out his operations themselves. Now, Ben 10 with his 4 aliens is on the mission to recover all the components before Dr. Animo completes his evil device! Fact: Ben 10 Savage Pursuit game is one of the most played Ben 10 Running Games available online. The aim of the Ben 10 Savage Pursuit Game is to reach the end of the trail and collect all the orbs and components. The path gets difficult as the distance covered by Ben increases. Dr. Animo’s mutants come in the way to obstruct and you will lose health if you touch them. You can either jump over them or attack them. Like most of the Ben 10 games, Ben can transform into different aliens but in this game, there are only four aliens i.e. Wildmutt, Wildwine, Heatblast, and Cannonbolt. Each of the aliens has a special ability that helps Ben to overcome obstacles and move forward in the game. To use Alien special powers, you have press Spacebar. Following are the special abilities of Ben 10 Aliens in Savage Pursuit game. So, just join the adventure and make Ben 10 to complete this game as he races against time! Collect all the orbs and components before the Time runs out and Be the Winner! Don’t Forget to give your rating for Ben 10 Savage Pursuit Game and share your tips and tricks to win this game in the comments section below.